You are here: Home / Miscellany / A New Look! My husband originally designed my website and has been talking for awhile about changing it up and it’s officially ready! I really love the new look and there’s some other little changes. I’ve been toying with the idea of changing up my tagline for awhile. It was “Modern Cross Stitcheries” but I’ve been feeling like that just isn’t enough to describe me anymore. I have been doing so much more than that lately. I have spent far more time with my sewing machine or embroidering lately than I have been cross stitching. I kept obsessing over coming up with something new and then my brilliant friend Julie suggested it didn’t need a complete overhaul, just removing “cross” was enough. 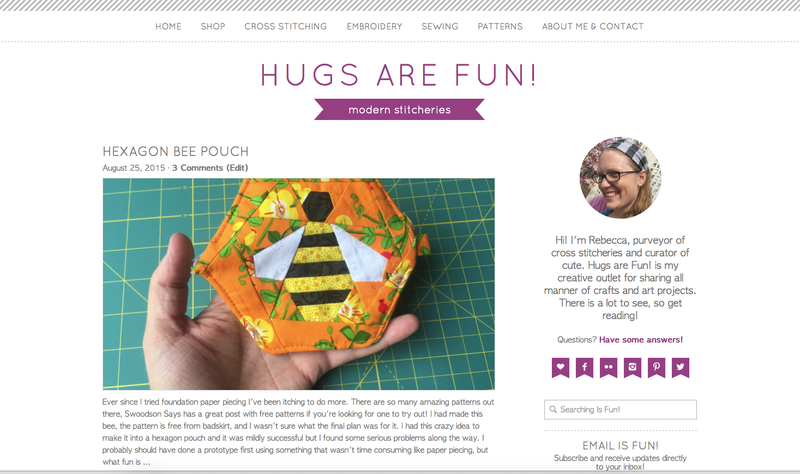 So this is the new Hugs are Fun – Modern Stitcheries. Now that this is up, the next order of business is to get my newsletter launched. I have a pattern locked and loaded to send out, I just need to get on it! It is amazing! Great job both of you!!!!!!!!!! !